When the report Public Health – Ethical Issues was launched at a meeting of the Nuffield Health Council in London in November 2007, every person, body or stakeholder who had made a submission was invited to be present. 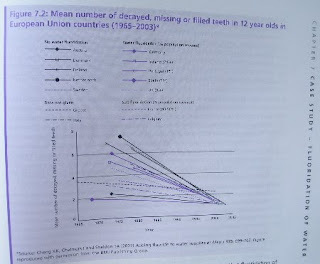 I was stunned because I had hoped that Nuffield – a name synonymous (in my book) with the highest standards of public and private health - would have taken all the evidence on board to put the proverbial bomb under the false claims and spin which have characterised fluoridation since it began in post war USA. Instead, it was being used as yet another coat of whitewash, possibly to underpin a new round of fluoridation scheme proposals. With Southampton in the (low energy?) spotlight and now Bristol, it seems I guessed right! When the chairman asked for questions, there was an eerie silence among the 300 or so attendees. I hadn’t intended to speak because I knew there were executive members of the National Pure Water Association present, but since they failed to say anything and the topic session looked like terminating without critical comment, I raised my hand and was offered the roving microphone. I asked how fluoridated water could be defended as being safe when, by raising its temperature as when cooking or making beverages in aluminium vessels, the ppm levels of aluminium fluoride would rise by factors of 100s, even up to possibly 800 for as long as it took to heat a pan of potatoes. I wasn’t allowed to continue because the chair, Lord Krebs, deliberately created an uproar - a rumpus among the panellists, terminating the meeting, despite being buttonholed by what seemed to be a substantial number of attendees, evidently unimpressed by his style of summarily closing the proceedings. It was not a good day for health service democracy!